I haven't written in a while, not because I've been maxxing and relaxxing, but because I've been in my head, trying to make a million tiny/huge decisions about how my app will function, and then what it will look like, and then how it will function, etc. This seems to be a characteristic of UX design, and it made me absolutely hate the process until I was able to collaborate with others, which then made it super fun and seem like something I'd like to do professionally. 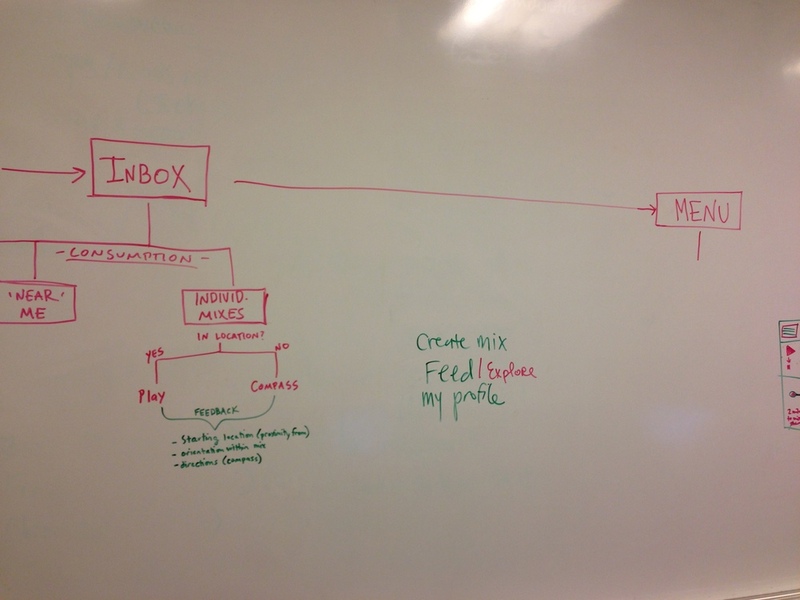 After some quality time with the Sarah Hallacher and Trent Rohner, I finally have a User Flow that makes sense to me both visually and executionally. Dashed outlines mean User Input, solid outlines mean Functions, and solid blue boxes mean Pages. I realized this past week, that I'm spoiled in terms of GUIs. As a designer, I, in the past, haven't often had to leave the Adobe environments that are so well-designed. Eclipse? The opposite. If using Adobe programs is like driving a new Prius, Eclipse is the manually-shifted pickup truck that your grandfather bought in 1982. Maybe that's not fair. Anyhow, I ran into a lot of problems treading out on my own [i.e., away from the comfort of the class tutorials] in the Eclipse environment and, since I've nearly decided to build my thesis in PhoneGap anyhow, I decided to abandon ship and pick up PhoneGap for the first time. Though I chose to start in iOS, my code will transfer to Android if I decide to go that way in the future. I started with a series of Lynda tutorials, 'Up and Running with Phone Gap', which are mostly helpful in building in iOS, but include setup instructions for Android as well. The 'course' does a good job of setting you up with an understanding not only of PhoneGap, but mobile applications in general. It was good for me to understand what it is that PhoneGap does, and how I can make it useful for me. So, I'll get down to it. The tutorial leads you through building an application that has a lot of elements to it: UI features with JQuery Mobile and Mustache.js, accessing the phone's Connectivity API to see if wifi/internet is available (need this for other APIs), tracking your location with the Geolocation API, using the Camera API, and the phone's native Storage API. This is all very exciting, as I will need to use all of those APIs, with the exception of the Camera, for the app I'm building for thesis. So, as an exercise in both learning a lot about PhoneGap and setting a framework for my Thesis, I think it was pretty successful. For our final project, I was a bit torn with feeling like I needed to do something in the P-comp vein. But, quite honestly, I just haven't been able to come up with any solid ideas that involve my building something electronic. That said, I have really enjoyed the Digital Footprint portion of our class, and have become quite fascinated particularly with the images that mark our digital experience. Last week, I worked on the beginnings of a picture book that abstractly visualized gchats between two people. I was very set on seeing this idea through to print, and then found the data that Google has saved for my own image searches.... from 2008. This has me kind of torn... working on a project that's about two people communicating with one another, taken to abstraction through an almost crowd-sourced curation, and then presented as a story, OR presenting a digital footprint as a diary, with image searches marking specific days and conjuring memories of searches. I plan to either decide later tonight, or have the class' feedback help me out tomorrow. For our midterm projects due next week, I have two potential directions I'd like to take. The first is an AR Google Streetview experience, and the second keeps track of how often you spend time with your friends. Do you remember Super MarioWorld, and the idea that you navigate this island to go into different levels? The island seems small, but as you get to certain points, you are led through a tunnel into an expansive world? So, that's kind of the outer shading of my idea for a mobile app that allows you to explore Google Streetview all over the world. Using your geolocation data, it turns Manhattan into something like MarioWorld. Depending on where you are, StreetView takes you to another place. For example, the Lower East Side could be the portal to Paris, and then, as you navigate the streets of Manhattan, all of a sudden the world inside your phone makes it seem as if you're in Paris. The idea of tethering two different maps to one another is what originally gave me this idea. I also like the idea that many people consider New York to have everything you could ever need in terms of culture and exploration. In this mobile experience, you can explore the world's cities without ever leaving Manhattan. My second idea comes from trying to balance my personal life with work and school. I often feel like I never see my friends, especially those that don't go to ITP.... but is that necessarily true? How long has it been since I've seen Kim, or how often do I really hang out with my boyfriend? It works by first entering the names of specific friends, and, with user input, tracks how often you see each friend. Another variable could track what you actually do with those friends. Do you always go to dinner at the same spot with Zoe? Are you always getting coffee with Marika? If you haven't seen your friend in a certain amount of time, you can set reminders that alert you to make plans soon. These are specific to individual friends, because some people we're comfortable with just seeing twice a year, and others we'd like to see weekly. I see this as useful, but also interesting conceptually with regards to online networks for friends, that actually rarely connects them in real life. The past two weeks have pretty much been split in half. The first half was a lot of doodling and spending time in my own head trying to untangle the design problems in front of me. The second half was spent on visual design and trying to make my ideas seem more tangible. In short, I made decisions about what I want my app to specifically accomplish, I have a [working] name, and I have developed 4 User Stories/Scenarios that will help when I move more deeply into UX/UI. Generated vs. Curated One big question was whether I wanted Users to be able to search and add songs to locations anywhere or if I wanted to limit the experience to generation alone. Based on the hurdle I experienced with User Testing and people having a hard time 'curating' a mix tied to a location, I decided to focus my thesis on the generation of mix tapes. I.e., the app will track your location and music consumption data, tie it together, and then allow the User to tie tracks together into a mix, or send individual songs, both tied to a physical location. Tracks vs. Mixes I got a lot of feedback about a mix maybe being too involved, both to generate and to consume, and a lot of people suggested that they'd like to get notifications based on their proximity to tracks that have been 'dropped' in specific places by their friends. Network/User Base This is less of a design constraint and more of a back-end thing, but I've been thinking a lot about whether the activity of this app is sent to an entire network (Facebook or Spotify or something), or if it's something more intimate (shared amongst 5 friends or less). I've decided that my thesis will focus on the latter. This is both interesting to me in its possibility to fail, as well as a more feasible plan programmatically. I have gone through a ton of brainstorming exercises for names for my app, and, at least for the moment, have landed on Dig.it (read: Dig It). I bought the doman name 'canyalldig.it', because of it's lighthearted reference to the Tag Team song (Whoomp, There [My Thesis] Is), but also because of the reference to unearthing these buried tracks. Apps that use geolocation usually don't acknowledge it… it's 'invisible' data. Sometimes it's 'locked', like with Foursquare. I like the idea of something being buried, and dug up by the User. The Curator This is a Mixer who actively listens to tracks in a specific order and in a certain location as a way of curating a mix. In the docs below, this is Ryan. The Mix Explorer This is a Mixee who receives and listens to mixes by exploring the map and unlocking tracks in a specific order. In the docs below, this is Ryan's girlfriend, Kelly. The Commemorator This is a Mixer who listens to tracks in a specific location and commemorates the time and space by later sharing the track with friends. In the docs below, this is Drake. The Track Discoverer This is a Mixee who passively consumes tracks mostly based on push notifications that there is a nearby track to unlock. In the docs below, this is Drake's friend, Will. This week, I had fun tracking a ton of activity from my input to my computer... key strokes, mouse clicks, application usage, etc. However, I didn't feel that there was enough data to make anything terribly interesting, so I chose to run the Most Interesting Words of the Month program on my entire Google Chat history with another person. I thought this was fascinating from Google's perspective, especially. Though I can recall specific conversations from some of the words, to a third party, especially a machine, what does this look like? I thought an appropriate visual translation would stick with the idea that we were using a Google service to chat... so what does Google Image Search see from these things? Is the abstraction funny? does it still tell a story? I batch-downloaded 30 images for each of the words in the first column, as a test to see if this could make an interesting representation. Here's what I got from a very very rough layout for the word 'whenever'. Shakira is involved, so it's not a total failure. As you can imagine, even with a lot of automation, this is a time-consuming process. If I decide to continue, I'd like to experiment with layout and index (how much of the chat do I include? 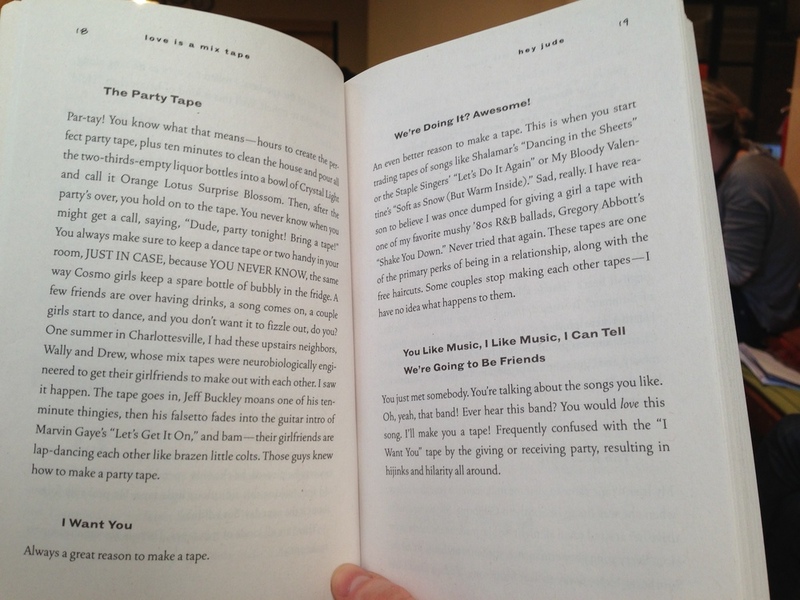 is each page just referenced in the back of the book? Would this make an interesting coffee table book?). Another visual experiment I did involved taking screen grabs of my desktop every minute for a full day. I'm mainly interested in this as a means of visualizing both productivity, but also to see what sorts of colors we are exposed to throughout the course of the day. Are most of the websites I visit white? What does this look like as an abstracted video? Again, I thought it only made sense to translate this visual tracking to something that would also exist in the same environment. So, I generated an abstract screensaver from my computer's activity from Feb. 21st. During last class and the past week, I've handed out questionnaires to try to get an idea of what functionality would be preferred for my app. I split the questions into two questionnaires— one perspective from the Mix Maker (Mixor), and one from the Mix Recipient (Mixee). Here are the results from asking ten people (five respondents for each perspective). 2/5 Curated. I will choose locations and songs prior to sending the mix. 2/5 Generated by my normal behaviors, i.e., I would like the app to remember what I'm listening to, where, and save mixes for me to later share. 1/5 A combination of the above. I would like it to be generated, but want the option to edit/refine before sharing. Suggested songs based on genre. Suggested songs based on time of day. 1/5 Suggested songs based on occasion. 3/5 Searching for specific songs by artist/album/title. 3/5 Accessing my playlists in other services (ITunes, Spotify, etc.). 2/5 As specific as possible. 3/5 Neighborhood specific, or just roughly based on geolocation. A combination of the above. Recipients could 'unlock' songs based on my specification for each song. 1/5 Linear and direct, with a specific song order. Static, set in one location. 3/5 Loosely linear, not necessarily direct, but a definite song order. 1/5 Wandering and random, song order is not important. 2/5 An adventure! The recipient doesn't know where they are going. 1/5 A companion. It follows a route the recipient takes often. 2/5 An A-to-B route, with surprises in between. The recipient knows the start and end locations, but the middle is a surprise. 1/5 A plotted journey. The recipient sees the entire map ahead of time and knows what to expect. 1/5 Directions/stories/comments for each track. 3/5 Directions/stories/comments for the experience as a whole. 2/5 Only audio attached to a location, nothing else. 3/5 Comment on my mix(es). 2/5 Reply with songs or another mix. 1/5 Only listen to my mix, I don't want a response. 4/5 Privately with one other person. Publicly with one other person. 1/5 Privately, but with 5 people or less. Publicly, but with 5 people or less. Privately, but with 10 people or less. Publicly, but with 10 people or less. 1/5 Privately, with anyone in my network. 2/5 Publicly, with everyone in my network. Privately, but I don't think number of recipients matters. 1/5 Publicly, but I don't think number of recipients matters. 1/5 Curated. I want to experience something my friend imagined or experienced in the past. 1/5 Generated by my friend's behaviors, i.e., I would like to listen to the same thing in the same place as my friend did. 3/5 A combination of the above. 4/5 In whole, at one time. 1/5 Little by little, discovering songs along the way. 1/5 In spurts. A few songs today, a few songs later on. Linear and direct, with a specific song order. 2/5 Wandering and random, song order is not important. 4/5 An adventure! I only know the starting point, but have no idea where I'm headed. A companion. It follows a route the I take often. 1/5 An A-to-B route, with surprises in between. I know the start and end locations, but the middle is a surprise. A plotted journey. I see the entire map ahead of time and knows what to expect. 2/5 Directions/stories/comments for each track. 2/5 Directions/stories/comments for the experience as a whole. 3/5 Reply with songs or another mix. 1/5 Only listen to my mix, I don't want to respond. 2/5 Privately from one other person. 1/5 Publicly from one other person. 3/5 Privately,from with 5 people or less. 2/5 Publicly, from 5 people or less. Privately, from 10 people or less. Publicly, from 10 people or less. 2/5 Privately, from anyone in my network. 1/5 Publicly, from everyone in my network. Thesis: Why do people make mixes? 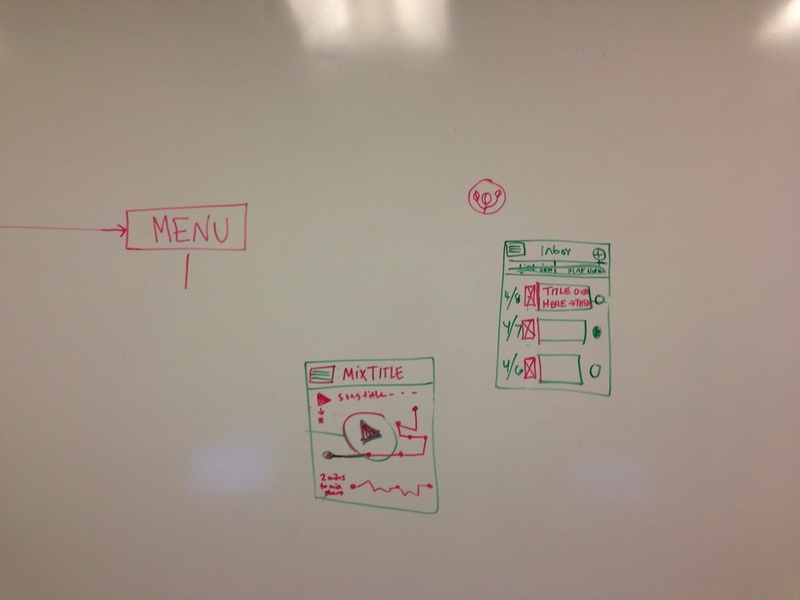 In my process of building a User Scenario, I have been thinking a lot about WHY someone would use my app. Though there are probably some mobile-specific reasons (they have a phone, they like apps), I don't think it has much to do with that. So, I have concentrated almost all of my efforts in exploring why people make mixes. Though I can imagine adjusting features to encourage the user to move towards any one of these scenarios, The Walking Tape, in particular, mirrors my idea to tie physical space to music. The emotional motivations (I Want You/Have a Crush On You/Want to Be Friends), I think, are also pretty spot-on, as I'd really like for my app to provide an intimate experience between two people. I also watched High Fidelity to further understand why people are excited about music and how they consider it as marketing pivotal moments in their lives. After a bad breakup, Lloyd, the main character, rearranges his records in chronological order by life event. This kind of relationship isn't necessarily a geo-spatial one, but is interesting as it sheds some light on how the relationship with music transfers off the record/computer screen/etc. and into our ideas of time and space. Everyone's Mixtape is a web-based service that allows users to create and consume mix tapes. Two things about this site are interesting to me: first, it takes a very skeuomorphic approach with the aesthetic. Secondly, the most popular mix categories mimic the categories from Love is a Mix Tape fairly closely, but with the addition of time of day. In User Testing and going through the User Scenario Questionnaire, that variable has been mentioned a lot. I wonder if adding an extra constraint would make the app more interesting, or add more of a barrier to entry. SO, WHY DO PEOPLE MAKE MIXES? As I progress into the User Scenario part of the project, I will prioritize and highlight which of these motives are the most promising/vital to my concept. Admittedly, I got a little behind last week with Thesis and finalizing my Big Screens project for our March 1st show, so this week has largely been a week of playing catch-up. First things first, I finally started using my Github account, and have set up a repository for my classwork, which can be found here. So, as of right now, I've gone through all of the screencasts to date, and am now working on concepts for an app I'd like to develop in stages through the end of the semester. More to come! In my first post, I wrote about wearing several hats during thesis, and being particularly nervous about project management. I started using Asana, which does a good job at helping me organize specific tasks and 'sections' of my project. This week, I also put together a chart to further help visualize deadlines, etc. Though it doesn't break down my time hourly (I've found in the past that that granularity actually hurts me more than helps), I've tried to account for every aspect of the project that is either required or just important to me (Concept Video/Documentation/etc.). Excited about the process!! In my previous post, I talked about my first round of User Testing. Well, as most things are, it was surprising. Here's the scoop. I was pretty down most of yesterday, because, after pestering my 'users' several times, I still didn't have too many responses. Even my best friend didn't participate, and she loves music. So I began to think my idea needed to be changed drastically. Sarah Hallacher, a student at ITP as well, lives in Brooklyn, 27, made a linear mix that gave specific directions that led the user from her place in Brooklyn to the L train to Manhattan. She overlayed her own design onto a Google Map. If I were making a location-based mix, I'd want to incorporate notes about some of the things I experienced while listening/walking. I'd probably give it to the person digitally so they could follow a list of instructions on their phone while walking. My mix is called checkmarksthespot because when I made the map I realized the shape of my commute is a backwards checkmark. Plug in your headphones by the time you hit Meeker Ave. Intend to change the song. Stop the song around 30 seconds before it's over. You have lost cell service and didn't make this Spotify playlist available offline. Elena Parker, a student at ITP as well, lives in Brooklyn, 26(? ), made a linear mix that gave specific directions that led the user into Prospect Park to relax. She sent a Google Map tied to a Spotify playlist. Spots are numbered. If i had some more time in my existence, I'd send the tracks with a nice design or etc. Get off the train at the Bergen Street 2-3 shop and start walking down flatbush. Listen to The Punch Brothers' "Movement and Location." Head into the park. Make sure you go right and stay on the paths. It should be pretty dark because there's lots of trees blocking the sun. Listen to Josh Ritter's "Rattling Locks." There's a cemetery in this vicinity. Check it out. Then proceed to lookout hill, which is to the right on this map. Climb up. Look out. Listen to Mark O'Connor, Yo Yo Ma and and Edgar Meyer play Old Country Fairytale. After you've made it down from Lookout Hill, walk back towards the entrance straight through the center of the park. It should open up a lot. People will be flying kites. Listen to "Don't Look Back" by She & Him. Lay down on the grass in the Long Meadow. It's a long walk. Listen to Nina Simone's "Just in Time" from the Tomato Collection. Nicole Puritsky, an Account Director, lives in Chicago, 31, made a mix that spans two locations— Chicago and L.A., where she is from, that follows the user as they travel (on the ground) from Chicago, and subsequently arrive in LA. She used a service called 'ZeeMaps' to make the map, and embedded YouTube videos as audio within each marker. Katherine Walker, an Elementary School Teacher, lives in Ruston, Louisiana, 28, made a mix that is somewhat linear, but not a direct path. The most exciting thing about her mix? She dedicated it to her first child, who she is having in August. I didn't know she was pregnant, so it was a really nice surprise dedication. She used Google Maps to identify the songs and locations. Christie Leece, a student at ITP as well, lives in Brooklyn, 32(? ), made a physical mix in custom 'wrapping', with custom title cards for each track. Not tied to a physical map, Christie's mix instead is a map of breakfast. My participants were only female. In fact, two males wrote back and said they had a really hard time with the location-based thing, and didn't have anyone in particular to make a mix for (they aren't in relationships), so they declined to participate. Is this a coincidence? Is my audience women only? Linear, Loosely-Linear, and Completely Abstract. Where is the happy medium? Directions! There were quite detailed directions for a couple of these mixes, and it seems to be an important way for the mix-maker to communicate 'the moment'. How do I incorporate? Lots of literal songs (Going back to Cali, Drive my Car at a Car Dealership, etc.). Is this important? Is there a way to contextualize songs that aren't necessarily so literal? When people make mixes, where do they start? What part do the lyrics play in helping them associate a location with a song? Dedication mixes. Though that was a pretty special situation that Katherine shared with me, I think there's something really compelling to keeping a 'mix diary' for someone. Turning my head around my thesis idea, I realized it was first pretty important that I understand how we've consumed music through time to really understand how the experience has changed and what I'm implying with the experience I create. I also looked into other apps that use unlocked content through geo-location, audio sharing, or both. I find this timeline fascinating not only from a technological advancement standpoint, but more so in thinking about how it has affected us exchanging and listening to music. For example, my first experience making a 'mix tape' was in grade school, when I recorded songs off of the radio onto a cassette tape. A time-consuming task, I had to wait for my favorite songs to come on, run to the recorder, press play, and hope that I pressed stop before commercials came on. Later, in high school, mp3s were around, and I knew one guy with a setup that let him make mixes easily, for $5/cd. We brought in a list of songs, paid him, and he'd bring us a cd back a few days later. Maybe we all know that guy. I'm really interested in the anticipation and the novelty of those mixes, as well as the intimacy that I experienced when receiving a custom-mix, made for me from someone else. Fast-forward to today. Just as I expected, I'm not the only one that has thought about an app that involves location-based audio. Here are some other apps that do something similar to what I'm thinking. This is the closest to what I'm thinking of, though it is limited to 'unlocking' the playlists in venues, rather than along paths, which is more the experience that I'm interested in. This isn't location-based at all, but is interesting in its ability to make music-sharing 'as easy as text messaging'. I'm not a fan of how mass it feels, though. Not what I'm going for. Sound Graffiti is really interesting to me as a tangible object. This isn't terribly realistic for one-to-one interactions I'd like to inspire, but relevant as a location-based audio experience. Also interesting— this isn't for users to create content… this is meant as a consumption experience… users consuming specific artists' music (this particular example is for Bob Dylan). Is the user aware of the entire route? Just the start and end points? Just the starting point? I.e., let me take you from A to……., let me take you from A to B, let me take you from A to B to C to…. How will I allow users to navigate? Do I need to make a map available? Can it be more simple? Would direction-based gestural navigation work? How is the experience different for the 'mixer' and the 'mixee'? What sort of features would support a conversation? Is a mix a conversation? Most of these questions I'm hoping to get feedback from in my User Testing process. For now, I'm focusing on brainstorming different technical approaches to accommodate for different experiences. For my next round of User Testing, I'd like to be able to have a basic navigation prototype to see how people react in that context. Lots of updates this week. First of all, I've settled on a new concept— one that still incorporates the themes that I was interested in from the start, but is more concrete in approach. In retrospect, my 'dream review' doesn't make a ton of sense now that I've changed directions, but maybe it helped me arrive at my new idea? Still bothers me quite a bit that it's not consistent. My new idea is to make a Mobile App that helps people share Geo-Located Mix Tapes. In other words, users could create and send mixes that were tied to a physical location. Perhaps one song is roughly at the intersection where you catch the bus, another is at school, another in the park. The recipient must travel the specified 'path' to 'pick up' the mix, hopefully resulting in a contextualization of space though audio and vice versa. Social apps seem almost too social. Can a more intimate experience succeed? Has technology made music sharing too fast/easy? Will people take time to participate in something more intimate, even if it takes more time? Where is that threshhold? What exactly makes a mix intimate? Does everyone experience the same intimacy? What kinds of connections occur between two people as a result of a mix tape? Is a mix tape considered a conversation, does it lead to a conversation, or neither? Does audio help people explore geographic terrain? My hunch is that what I'm describing is an intimate experience that probably varies between individuals. I have my own ideas of what I would build for myself and my friends, but I'd like this to be a tool for more people than that. That said, I'm not sure I'm completely concerned with marketability… I'm more interested in exploring and answering my above questions. Please make a mix for anyone you'd like. The mix should include at least 5 songs. 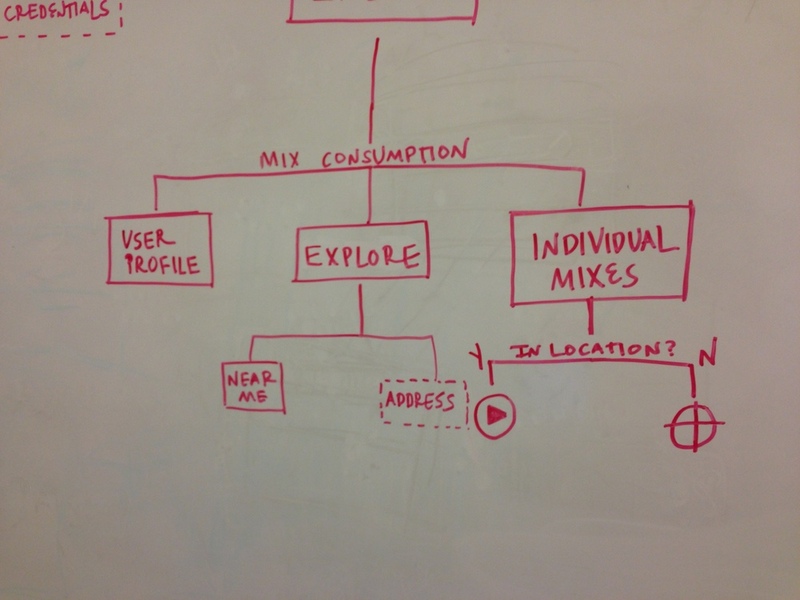 You must include a map with the mix, identifying which audio should be experienced where. (this can be a google map, printed with hand-drawn circles, whatever is easiest for you). Please document the songs you chose, the map, and the presentation to the recipient (is it emailed? is it a physical cd? etc. ), and send them to me! So far, around ten people have agreed to participate. I have yet to receive any documentation, but I'm looking forward to seeing the different interpretations of the assignment! In addition, one person wrote back and said they found the assignment too difficult and absolutely didn't associate music with a physical space. I'm actually hoping I get some more responses that are similar (not too many of course, but it's nice to have different perspectives). I'm assuming/hoping something insightful will come from User Testing that I can wrap into a name for my thesis, but, in the meantime, I've been brainstorming a little— mainly just to make the project seem more concrete. I don't have anything polished, but some of the brainstorming has led me to think about how my project will be used/viewed. For example, the word 'hunt' suggests a game-like approach. 'Dance' is significant to one way music is seen, but may be limiting. I like the visual imagery of a path, a string, a strand, and a series of links. This is all very rough, but it's where my head is at the moment.